Many of you know about the very popular Mississippi Pot Roast, but did you know that there is a chicken version, too? 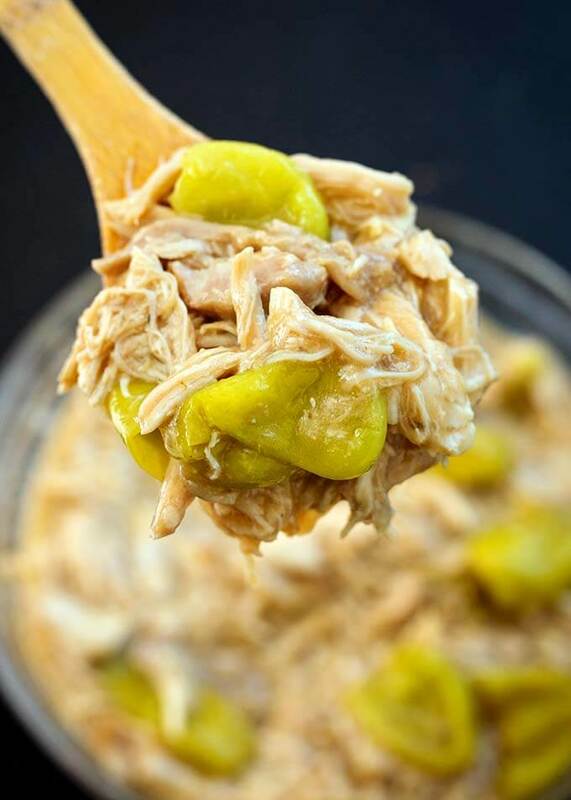 Instant Pot Mississippi Chicken uses chicken thighs or breasts and has the same flavors as the beef version, only with chicken! 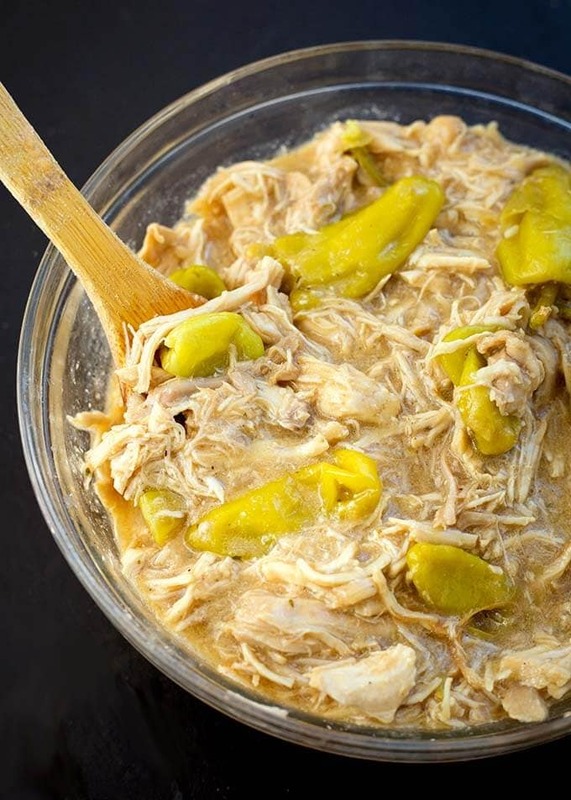 Pressure cooker Mississippi Chicken is full of flavor and easy to make! I love to cook from scratch. I really dig the process, and the way I can lose myself in making a fabulous meal. Sometimes I take a shortcut or two. No shame in that! 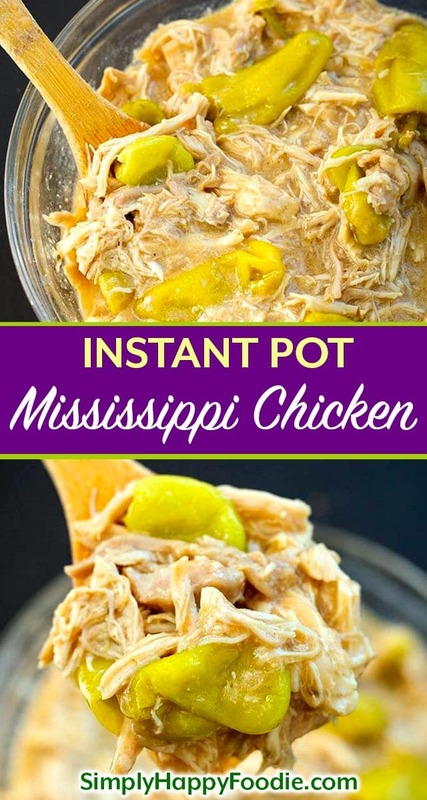 With this Instant Pot Mississippi Chicken recipe, the shortcut is the seasoning packets. Yes, one could make their own seasoning blends, and I do, but not with this recipe because I’d never get it right! I love the flavors of this recipe just the way it is. Thank you Robin Chapman, wherever you are! What’s great about this recipe is that I can make it in under an hour, so that makes this a good weeknight dinner. The other thing is that I can feed a group of hungry people just by adding a bit of extra chicken. I have packed my instant Pot pretty full of meat and still had it turn out perfect! **This recipe can be a bit salty. I suggest finding low sodium au jus and/or ranch dressing mix, if you can. I have a recipe for Homemade Ranch Dressing Mix that is lower in sodium than the commercial brand. You can even completely omit the salt in this mix if you want. Pepperoncinis are the kicker in this recipe. They are not very spicy, though they look hot. They add a tang and some saltiness that just makes this recipe. If you don’t want to eat them, cook them whole in the recipe and just pick them out and give them to me! I love them! Add the chicken, broth, pepperoncinis, seasoning packets, and butter to the pot. Put on the lid and set the time. Easy! Why not cook some rice with it? Get a tall trivet and set it down in the pot so it touches the bottom. I rinse some long grain white rice and toss it in one of my ekovana stainless pans with some water and cook it right along with the Instant Pot Mississippi Chicken! You could add potatoes if you want, instead of the rice. Then I use a Topolo pan gripper and set the pan on the tall trivet. Put the lid on, set the time, and go play while dinner cooks! 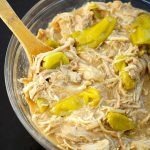 Instant Pot Mississippi Chicken is a take on the amazing Mississippi Pot Roast recipe created by Robin Chapman. Make this in your pressure cooker in under an hour. You can even cook rice with it! Put chicken in the bottom of the inner pot of the pressure cooker. (If using chicken breasts, cut them in half, if possible). Add all of the other ingredients and close the lid and lock it in place. Turn the steam release knob to the sealing position. Press the Pressure Cook/Manual Button (or use dial) and use the + or - button to select 8 minutes (if using frozen breasts that you can't cut in half, set time to 15 minutes). When the cook time is finished, let the pot sit undisturbed for 5 minutes (5 minute Natural Release). Then turn the steam release knob to the Venting position to Quick Release the remaining steam/pressure. 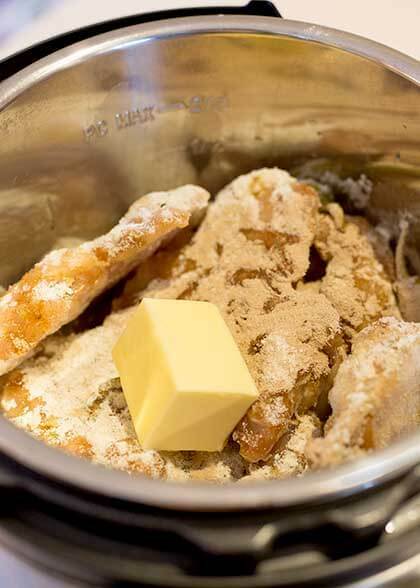 After adding all ingredients, set the tall trivet in the pot and make sure it touches the bottom of the pot. Put the rinsed rice and water in the pan and set it on the trivet (A Topolo pan gripper helps with this). Close lid and proceed with cooking directions (takes the same time to cook as the chicken. When the cooking cycle finishes, let the pot sit undisturbed for 5 minutes (5 minute natural release). Then turn the steam release knob to the Venting position to Quick Release the remaining steam/pressure. 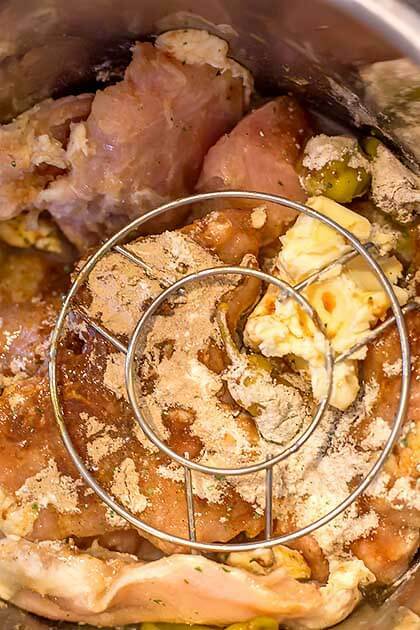 Use tongs to remove the chicken and shred it. If you want to thicken the cooking liquid, turn on the Sauté function and stir in 2 Tbsp of cornstarch mixed with some of the hot liquid. Pour into the pot and stir until thickened. Mix the chicken back into the cooking liquid. Serve over rice, or potatoes, on tortillas, etc. *If using frozen breasts that you can't cut in half, set cook time to 15 minutes. I like to add small red potatoes to Mississippi Roast. Would I just throw them in with the chicken? Hi Julie, yes, just use either small ones, or cut them into halves or quarters as the cook time isn’t as long as with the pot roast. Hi. I wanna make this tonight. Im new to the IP. I have a size 8 IP & am not much of a cook. I don’t understand the rice part. So, you don’t add the rice right in the juice? You said put it on top? On top in what? You put the rice in a pan with a 1:1 ratio of rice to water. The pan should be about 7 or 8 inches in diameter to fit the 8 qt pot. You will put a trivet/rack in the pot on top of the chicken and then set the pan of rice/water right on that rack. It helps to have a trivet with taller legs than the one that came with the pot. Not sure what happened, but I followed directions exactly using frozen chicken breasts. My chicken was not done and Very tough. Wonder what was wrong? Hi Leigh. Sorry you had trouble with this recipe. Were you able to cut the chicken breasts in half? If not, increase the cook time as indicated in the recipe (I made a note for frozen breasts that you can’t cut in half). You can always close the lid and cook for a few more minutes when something isn’t all the way cooked. Thicker foods will take longer (hence the cutting breasts in half). I hope this helps you for next time. You mean in half horizontally? Just in half to make the breast smaller, but not too small or thin. Not like butterflying, so I think it’s vertically. Excellent recipe, so fast and easy. I added small gold potatoes right in the sauce and they were perfect. The chicken was tender and juicy and the sauce is layers of delicious flavor. I sometimes cook for a lower sodium special diet and used unsalted butter and a homemade low sodium ranch mix and next time I need to reduce salt I will use water instead of broth, a low sodium gravy mix and probably less Pepperoncini juice. Thanks for posting, this is a company worthy meal. Hi Kat, I’m glad you liked this recipe! I also like to use unsalted butter, but have never used low sodium ranch. That’s a great idea! Thank you for taking time to review, and for the tips! We made this for dinner a few nights ago and LOVED it. It was so easy and tastes delicious with just the right amount of spice. Thank you! Hi Sara, that’s great! Thank you for your review! Would you have directions to do this in a crockpot? Hi Makayla, just put the chicken (boneless/skinless thighs are best) in the pot (you won’t need to cut them), then the pepperoncinis & their juice. You can omit the chicken broth. Sprinkle on the ranch & au jus. Then put the butter on top of the chicken. Cook on Low for 4-5 hours. Can this be adapted to a slow cooker/crockpot? Yes, Chrissy, just put the chicken (boneless/skinless thighs are best) in the pot (you won’t need to cut them), then the pepperoncinis & their juice. You can omit the chicken broth. Sprinkle on the ranch & au jus. Then put the butter on top of the chicken. Cook on Low for 4-5 hours. Do you use bone-in or boneless chicken? Hi Jennifer, I use boneless. Very good, and so easy! My nine year old enjoyed helping…kids ate it, but didn’t love it like the parents ? Will definitely make again! Only tweak, I cooked mine for 10 minuets with natural release…my chicken thighs were frozen. Hi Jael, that’s great that you all liked it. For the kids, you could omit the pepperoncinis, and serve them on the side for the adults. Just a thought. Thank you so much for your review! Hi Debbie, I’m glad you liked it! If it was a bit too salty, you can add a little water and thin out the sauce a bit. Then just use a slotted spoon if it is too loose. Or put it over mashed potatoes! Thank you for your review! Hi! Should I cook this on high or low pressure? Sorry if I missed it in the directions! Hi, it’s High pressure. All of my recipes will be High Pressure, unless otherwise stated. Thanks for your question! How tall is a “tall trivet” ? and showing the I-P 3-qt mini on your webpage … is a faux-pas. I sincerely doubt this recipe can fit in the 3-qt. Other versions of this recipe state it should be made in 6 or 8 qt I P. Also, would you provide more definitive detail regarding the 6″ or 7″ pan in which to simultaneously cook the rice. Is that dimension the diameter or height ? … Suggestion for source of pan would be helpful. The good news is that yes, you can easily make this in a 3 qt. The recipe states 2-3 lbs, so use 2 lbs. A tall trivet is a trivet that is taller than the one that came with the IP. 2.5″ legs is pretty typical. In the world of electric pressure cooking, when you say a 7″ or a 6″ pan, you are always referring to the diameter. The height is usually between 2 and 3 inches. You can find the pans on Amazon. Hope that helps! Thank you for taking the time to comment/question. Thank you for this. I finally made something that worked. Very good. Without this tutorial I don’t think I would have even tried. Hi Bonnie, thank you for letting me know that this worked for you! 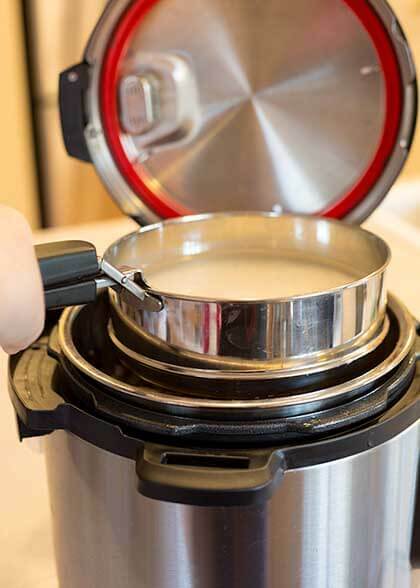 Pressure cooking is such a different animal, isn’t it? I hope it gets easier from here! Didn’t see weight watchers smart points. Hi Peggy, if you are on WW, you can use their calculator. I am not on WW. So, I have a question. I’ve found recipes for Mississippi Chicken and Mississippi Beef. What about pork? (I’d ask about lamb (my favorite meat), but it’s too expensive to experiment with.) Any ideas on what cut, cooking time, etc? Hi, a pork shoulder would be really good. Trim off as much of the fat as you can first. I would cut it in large chunks (or just buy country style ribs, same meat). Cook for 40 minutes or so if the meat is cut in chunks. Then, when it’s done cooking, skim off the fat from the liquid before eating. Use a spoon or a turkey baster. I hope that helps! Thank you for your review! Is this very spicy? My husband is a wuss when it comes to “packing the heat” in food. No, it’s not very spicy, as long as the pepperoncinis you buy are not the spicy ones. LOVE this recipe!! I made it for dinner tonight and OH. MY. GOODNESS. It was easily one of the best tasting things to come out of my kitchen! The tang from those peppers with the flavors from the spice packets… oh my. I used frozen breasts and cooked it for 15 min, turned out perfect! Thank you so much for sharing such an easy, quick, and DELICIOUS recipe! That’s awesome, Daphne! I’m so glad you liked this recipe! It’s so fast, too, isn’t it? Thanks for your review! I don’t have a tall trivet. Do you think I could make a foil bowl to cook the rice in and place it right on top of the meat? Yes, as long as it stays put! Quick and flavorful chicken! It’s only my fiancé and I so I used a little over 1 lb of chicken with the same measurements and still turned out great. I had frozen chicken and it was still juicy and fully cooked through. My grocery store was out of au jus seasoning packets (after the holidays) I used liquid gravy and just as good! Thank you, Alyssa, so glad you liked it! I made this exactly as written. I am not sure if it was just because we stick to a VERY low sodium diet because of my husband’s heart attack, or because the mixes were high sodium (not that high, but certainly enough to make note of), but this was really salty. Next time I may rinse the peppers to remove any brine and substitute another gravy mix for the au jus mix (I am thinking this was the culprit) At any rate, had it not been so salty, it would have been good. It was certainly easy to make. Hi Margaret, yes, this is the biggest complaint about the “Mississippi” recipes. I posted this recipe quite a while ago, and have just updated it to give some options for a less salty result. I suggest finding low sodium au jus and/or ranch dressing mix, if you can. I have a recipe for Homemade Ranch Dressing Mix that is lower in sodium than the commercial brand. You can even completely omit the salt in this mix if you want. Using unsalted butter, and water instead of broth. 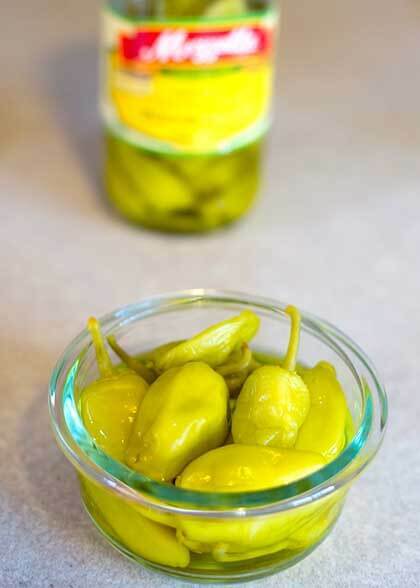 Rinsing the pepperoncinis may help, but you still want some of their tangy flavor! Thank you for your review!